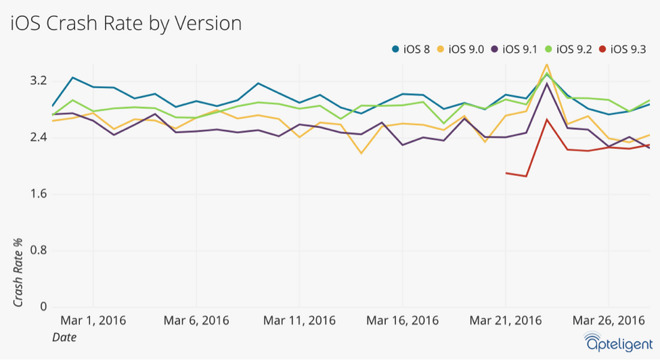 Despite its much-publicized problems, Apple's iOS 9.3 is showing a lower crash rate than all active iOS builds, an app analytics firm reported yesterday (via AppleInsider). According to California-based Apteligent, over the past eight days iOS 9.3 has had a crash rate of only 2.2 percent, making it the most stable iOS release in circulation. Apple's new iOS also beat the latest version of Android, which had a reported crash rate of approximately 2.6 percent. By contrast, iOS 8, iOS 9 and iOS 9.2 have all fared worse over the month of March, with crash rates of 3.2 percent meaning their users were more likely to experience problems than early adopters of Apple's latest mobile OS iteration. The study will come as a surprise to many, following media coverage of issues reported by a number of iOS users. Apple is aware of an issue causing web links to crash in multiple iOS apps like Safari, Mail, and Messages, and says it is working on a fix that will be released "soon" via a software update. The bug was the second major bug to affect iOS 9.3 users. The first rendered some older devices unusable due to a problem with Activation Lock, which required customers to enter the information originally used to set up their iPhone or iPad. Apple released a new version of iOS 9.3 on Monday to fix the issue. You get what you measure. Misbehaving feature or a non-severe bug may not crash anything, so according to the measures everything's fine, but at the same time the user is frustrated with yet another glitch. My experience with 9.3 is excellent. I clicked the link on my phone, it didn't work. EDIT: Okay people it was a jooooooke. Obviously I understand the complex process of rolling out even a moderate update of a major OS to a wide audience. I love Apple, as you can probably tell by my Jony Ive avatar, and this was a bit of a rag on all major tech companies and the routine they go through for their updates. Without trying to sound overly crazy, iOS rarely crashes anyway, I don't remember the last time I saw springboard reset or something. This is a joke, right? I'm going on Day 6 of my iPhone being unusable due to the links bug. What a stupid comment. Apple has hundreds of millions of customers using iOS and it would be impossible to put out a version that works 100% for every single user. Even if only 1% of users are having a problem that's still millions of customers, but at the end of the day there's nothing you can do about that. Every device is unique, with different apps and services running, everyone uses their devices in different ways. That inevitably means that 101 things can and will go wrong. Apple patches what they can but it would be impossible to find out every single problem and push out a fix for it. Fortunately I don't have any of these issues that people seem to be complaining about on the web, the same goes for the hundreds of millions of customers who aren't making a song and dance about it. The minority seem to shout the loudest and it amplifies. The figures speak for themselves, plus I seem to recall Craig Federighi saying recently that things have gotten better according to their own data. Just because one person has a problem and they feel entitled to have it fixed right there and then doesn't mean they speak for iOS and every user as a whole. LOL! This is best laugh I have had all year. Yeh totally stable expect I can't click on any links without it crashing....OK.
EDIT: They are analyzing it wrong! !